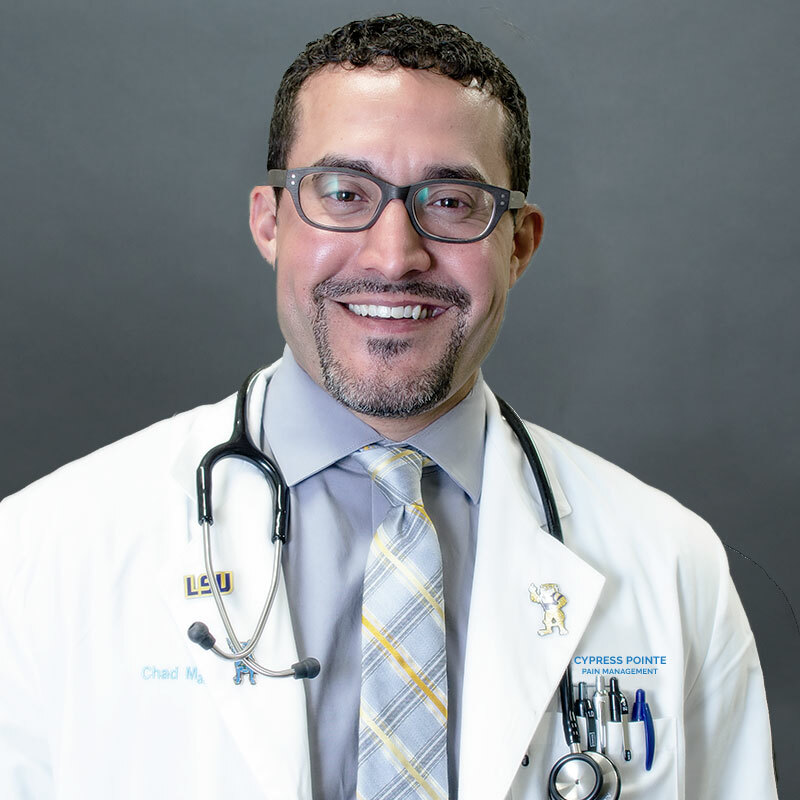 Dr. Chad Domangue, a south Louisiana native, is an Interventional Pain Management Specialist with extensive training in diagnosing and treating conditions that cause decreased functionality and acute and chronic pain. He completed his residency at the Medical University of South Carolina in Charleston and completed a fellowship at the University of Kentucky with Dr. William Witt, completing advanced procedures in interventional medicine. Dr. Domangue is Double Board Certified in Neurology and Pain Management, and board eligible in Clinical Neurophysiology. Currently, Dr. Domangue practices medicine in several locations across Southeast Louisiana and is a physician-owner at the last physician-owned hospital in the United States, Cypress Pointe Hospital, located in Hammond, Louisiana. As a result of his unique credentials, Dr. Domangue is one of the most sought after experts in his field for legal depositions. Dr. Domangue has developed a reputation as a pioneer in the field of medicine, as he is not afraid to challenge the status quo in order to provide better treatment options for his patients. In addition to his medical practice, he has invested countless hours in research and training physicians around the country on the most effective techniques available within the field of interventional pain management. Recently, he testified as a Medical Expert before the Louisiana Senate Health and Welfare committee about the potential use of medical marijuana as an alternative to opioids in treating chronic pain and was instrumental in the committee passing the bill. Through interaction with thousands of chronic pain patients, Dr. Domangue recognized that many chronic pain patients are also struggling with anxiety and stress, but the options available for treating their anxiety are not terribly effective or healthy. He realized he was prescribing anxiety medication that he would never take himself, so he focused his energy on developing a natural, safe alternative for his patients and others grappling with the physical and emotional consequences of anxiety. The YNRC Relaxation Shot® is the culmination of his years of brainstorming and investigating options for the treatment of anxiety, and it is a testament to his dedication and commitment to holistic remedies that can alleviate suffering and improve quality of life.